Raising high its colours in a shiver of triumph? That cries out the new hope now dawning? That creaks the rigging aloft in the lucid air? That hastily unfastens the silk apparel of day? 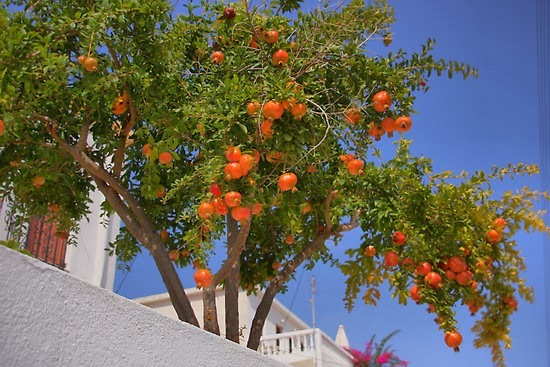 On the breast of our deepest dreams, is that the mad pomegranate tree? 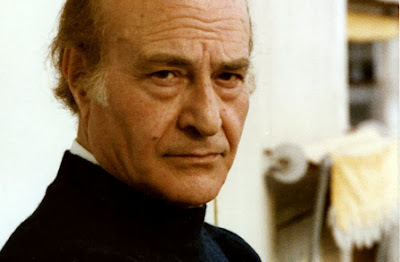 At the beginning of his luminous career, the great Greek poet and Nobel Laureate Odysseus Elytis said: “I write so that black does not have the last word.”Black and light, sunshine and darkness, these were the two poles of Elytis’ poetry, a pendulum between passion and patience, a bewilderment stretching throughout the day. At the beginning, he was acclaimed as the poet of the sparkling Aegean .The best of his Poetry - such as The Mad Pomegranate Tree, Commemoration, Aegean Melancholy, Body of Summer, and Drinking the Sun of Corinth, distils vividly and evocatively the typical features of the Aegean scene: its closeness to the natural world, its startling colors, and its hints of the simple and the unsophisticated. In “The Mad Pomegranate Tree”, the poet answers to the difficult questions hanging from its branches (”Tell me, that which opens its wings on the breast of things / On the breast of our deepest dreams, is that the mad pomegranate tree?”).One has the feeling that it is the mad pomegranate tree that drives the world. The unabashed pomegranate tree dances and dances in the ear. It sings and stuns the mind with extravagant repetitions. ( ‘Tell me, is the mad pomegranate tree’). The sound of joy repeating and rushing seems to careen wildily ahead of our thought with tickling uncontrolled energy. Also, there is something of the frenzy of a Van Gogh painting in this - an urgency to capture the beauty of the various images, as if it would slip away if not grasped at immediately. The poem is intoxicating and invigorating at the same time, lulls you into a trance with its rhythm and repetitions but awakens you to a different world. I simply love the lyrical surrealism that lingers in this poem. Whenever I read this poem, I gain a rare ‘ Elan vital ‘ (the current of life, the way Bergson used it). I feel that I have the heart of Bacchus to revel and rejoice; I am charged with 440 V to recklessly rush forward, to dance, to fly, to laugh around and do all the naughty things I had dreamed of. Poetry is Viagra! The mad pomegranate tree will continue to toss in the wind and “scatter its fruit-laden laughter” lifting up my spirits with buoyancy and bliss in my ritual for renewal. This poem is pure Mozartian rhapsody.